Randall Stevens is an AEC industry veteran with over 25 years of software development, sales and management experience. Randall founded ArchVision in 1991, a software development firm specializing in 3D graphics and content management technology for the design industry. Randall offers a unique combination of expertise in software and graphics technology, coupled with a background and degree in architecture. Randall is the inventor of the software technology Rich Photorealistic Content (RPC) currently being used by AEC customers in more than 100 countries and chosen by Autodesk as the native tree & planting solution for Revit. Through ArchVision, Randall has built relationships with the industry's leading design and visualization software companies. Most recently Randall has led product development for the AVAIL platform, a fresh approach to the AEC market's content management challenges. Randall received his B.A. from the University Of Kentucky College Of Architecture and served as an adjunct faculty member at the College of Design at the University of Kentucky from 1991-2007. He currently teaches entrepreneurship at the University of Kentucky College of Business. Randall chairs the Advisory Board for the University of Kentucky Innovation Network for Entrepreneurial Thinking (iNET) and is on the Board of Directors for the Kentucky Governor's School for Entrepreneurs. Randall initiated the inaugural Building Content Summit (BCS) in 2015 and currently serves as the BCS Chairman. What better way to kickstart 2019 than with an AVAIL update! We’ve made improvements you’re not going to want to miss across AVAIL Desktop, AVAIL Browser for Revit and AVAIL Stream. This release concentrated on improving the experience of sharing Channels with members of your team and marks the commercial release of the Standalone Mode for the AVAIL Browser for Revit. We had a major overhaul to the setup and configuration of what we now call Teams. The manage portal on getavail.com was recently updated. What used to be referred to as “Manage Users” is now “Team Members”. For those of you not using SSO (Single Sign-On) you’ll find a new “Team SignUp Mode” that makes it easy to add members to your Team via a Shareable Link. You can also now restrict new users by domain making it easier than ever to build out your Team. We made improvements to the Shared Users feature with the AVAIL Desktop to take advantage of the improvements to building your Team. Now everyone, including Enterprise customers using SSO, can easily search for members on their Team using First Name, Last Name or Email. As you begin typing in the Search Members box you’ll see a list of Team Members matching your search criteria and easily invite them to your Channel. Users of the free version of AVAIL can also now create Teams and begin sharing Marketplace Channels and their own two free Channels with others in their firm. Subscribers to ArchVision RPC or ArchVision Family and Detail Warehouse can also now login to AVAIL using their ArchVision account for authentication. Bug fix: At some point we introduced a bug that was causing Keys that you had set in Tags & Filters Editor to not remember the new Key when indexing new content with the same Value. We fixed that! We’re officially now out of beta with the Standalone Mode of the AVAIL Browser for Revit! What does this mean? It means you can now view and search for Revit content directly in the AVAIL Browser for Revit without opening AVAIL Desktop. You now have the option of running in either mode (Standalone or Desktop). The AVAIL Browser for Revit will recognize when you launch the AVAIL Desktop and switch modes automatically! We’ve also improved some usability within Standalone Mode such as the ability to Pin Channels as well as remember the last Channel you were using upon launch. For you Publishers we made some improvements to the Revit Project Thumbnail Generator. You now have the ability to select Families, Drafting Views, Sheets and Other Views independently for processing. A great time saver when you only need to update specific thumbnails. On the admin front we improved the installers to adhere to Autodesk-recommended certificate installation in order to suppress that pesky “new addin found” warning. Fixed issue with loading of view names containing multiple dash characters. Fixed issue when reloading Families with a Type Catalog. Ability to add the AVAIL Browser for Revit to the Quick Access bar in Revit. Corrected Analytics reporting of Project Name vs Filename. Fixed issue with drag and drop of views when drilling into views of a sheet. Fixed display of blank view upon upgrading within Content Mode. Stream has been updated with full support for Revit parameter harvesting. The same Revit configuration file you use with the AVAIL Desktop is now supported with Stream. If you’re a Stream user contact support@getavail.com for the update. I attended Autodesk University 2018 in Las Vegas week before last along with several others from the AVAIL and ArchVision teams. That included participating in the Autodesk developer conference on Monday now known as Forge DevCon. Thanks to everyone who stopped by the AVAIL booth to say hi or attended one of our after hours events. It was a great chance to catch up with longtime friends as well as make new acquaintances. These conferences are always a great way for us to learn more about specific industry challenges and trends as well as dig into the intricacies of workflow challenges you each face. That’s the primary reason we attend and thanks to everyone who shared insights with us. Long plagued by fragmentation, the AEC industry is at an inflection point. There’s no doubt that consolidation is happening at all levels. I’ll focus here on the software and technology aspects of the industry. I thought I’d share some thoughts on the prevailing theme for both Autodesk and the industry as a whole. The AEC industry has not taken advantage of standardizing across design and production workflows as have vertically integrated industries like automotive and aerospace. They’re not apples to apples comparisons I know but I think everyone can agree there’s much to be learned by studying these more vertically integrated industries and applying what we can. I believe Autodesk is making some good moves with their Forge platform with this regard. Over the past three decades Autodesk has made its mark developing desktop applications that became the backbone of many AEC industry workflows. The challenge was (and continues to be) efficiently moving data between these applications. The data is often stored (and transferred) via proprietary file formats and moving between modeling and visualization, documentation to construction and eventually facilities management has appealed only to the masochist among us. With Forge, Autodesk is building a new common data layer on which multiple services and applications will be built. Forge promises to make the transfer of data across those services and applications more painless and they’re once again focused on supporting an ecosystem of 3rd party developers to build specific solutions on top of the platform. 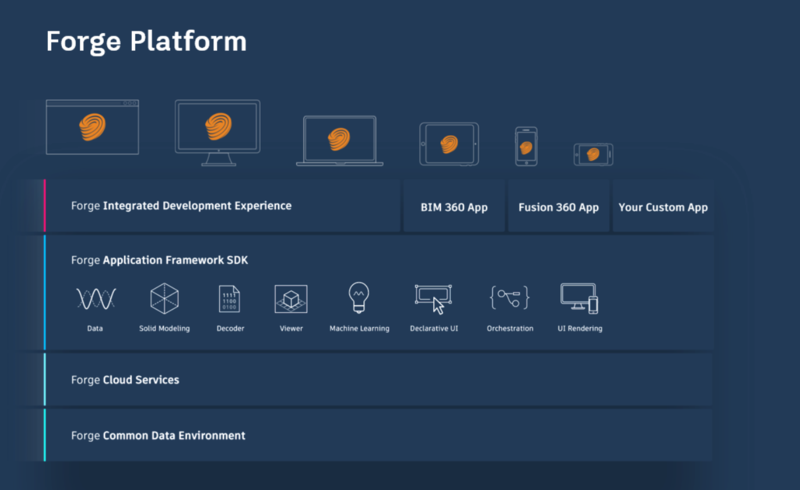 Forge promises to break down the dozens of application silos Autodesk built (or acquired) over the previous three decades. After talking with hundreds of customers over the past year it’s evident that application (and thus workflow) silos are one of the major hurdles facing every firm. How do you efficiently manage data and information that needs to flow across dozens of applications you’ve chosen to use across your firm. There are multiple challenges with the siloed approach to application and data management that plagues our industry; 1) Infrequent use of secondary systems means employees must basically relearn applications with each use, 2) Inconsistent design philosophies and nomenclature across applications becomes confusing, and 3) the managerial cost of supporting multiple solutions is unbearable. To add insult to injury we’re now muxing on-prem and cloud-based solutions. This threatens to become the new bane when managing workflows across these new silos. We’re paying extra attention the complexities this causes regarding “content” and file management. “Where” a file is (or needs to be) is becoming increasingly ethereal in this new era. At AVAIL we see efficient content management across the project life-cycle as one of the major challenges to the industry. We’ve taken a decidedly horizontal approach to the problem ensuring that AVAIL can handle a variety of basic needs across oft complicated workflows. AVAIL customers are managing their 2D and 3D models in the same system alongside their visualization assets, photos and other precedent materials, scripts and documents. The design teams use the same solution servicing the marketing department. This approach ensures that everyone using AVAIL is learning to use the same solution regardless of the content or application. By knocking down siloed solutions and replacing them with a single-point-of-truth AVAIL is doing its part to make you, your firm and the industry as a whole more efficient. Wow! We think that’s going to be your reaction to this latest release. Even though the dev team here at AVAIL were calling this a “hardening block” of work, the impact on you and your team’s workflow is tremendous. Once this is configured, every Revit Family and Project file indexed into AVAIL will automatically have a Revit Version, Revit Category, Host, and File Type Tag. You’ll find a configurable RevitTagGenerator.xml file located at %ProgramData%\AVAIL\addins. Simply open the file with a text editor like Notepad to edit. There’s a full set of instructions inside the file. The great news is this was implemented under a new AVAIL “plug-in” architecture for file-type handlers. We’ll be adding data harvesting capabilities for other file types. Be sure to let us know what which ones should be on the top of our list. New Project Mode (for Team and Enterprise customers) provides a visually stunning new way to browse the content “in” your Revit Projects. We made some great improvements to scrolling in the AVAIL Desktop app. Way to go Zach! Tip: Did you know you can Ctrl-scroll to adjust thumbnail sizes in AVAIL Desktop? Now you can see what additional Channels a piece of content exists in before making edits. Look in the Properties Panel just above the Tags list. You can now index URLs directly into an AVAIL Channel. This is an awesome new feature. Just drag and drop a URL from your browser directly onto an AVAIL Channel. This is great for linking to intranet locations or manufacturer information on a website. We’ve made it easier to copy Tag Values from Properties Panel. Stream is a game-changer for the AEC industry. AVAIL Stream means you no longer need to manually publish content, the bane of content management solutions everywhere! We’re continuing to roll stream out to AVAIL Enterprise customers. The latest release has knocked out several in-the-wild obstacles we uncovered earlier this year. If you’re and AVAIL Enterprise customer and not on the Stream install list email info@getavail.com to start the process. We made a major overhaul to the way AVAIL reports analytics data providing you with even more granular insights into what and how people are using content in AVAIL and your Revit Projects. AVAIL now takes advantage of what are called “Custom Dimensions” in Google Analytics but it requires you to set them up in your account ☹. There’s 20 of them but you only have to do this once . Do it today because without them you’re not capturing some of your most important data. One of the observations we’ve made regarding the current state of content management is the strong reliance on two tools to manage your company’s files be they on a WAN/LAN or in the cloud; the ability to create and name file folders and the name of files themselves. I don’t have to tell you how limiting those tools can be. Our only option for decades we’ve all become somewhat numb to the pain. We think there is a huge opportunity to improve both management and access to content. In many ways the existing file folder and file name means of storing and retrieving files has pitted the needs of centralized control and file management versus the ease of finding what you’re looking for. AVAIL is providing a new alternative, a way to separate where a file is stored from how it is retrieved. A way to reduce your dependency on those cumbersome folder and file names for retrieving content. One of the themes we’ve developed over the past couple of years during the development of AVAIL is optionality. Optionality should be a good thing. Given optionality you take advantage of an opportunity when it presents itself. Optionality is present in several ways at the core of how AVAIL has been designed. If you’ve used AVAIL or sat through any of our webinars you’ll hear us talk about the important of context in retrieving content. That’s a form of optionality that lets the publisher and consumer of content in AVAIL get to the same content in different ways mirroring the way you’re thinking about it at the time. With the new 3.0 release of AVAIL you’ll find a couple of additional features that play on this theme as well. We’re extending the ability to contribute to the management of content in a Channel in AVAIL beyond the firm-wide Publisher/Consumer role definition. Now, the owner of a Channel can allow anyone they’ve shared that Channel with the ability to contribute via a new “Can Edit” setting that is controlled per user. This means a Publisher of a Channel can invite select others to add or remove content and tags from a Channel without having to make that person a firm-wide Publisher. Optionality. Another update in 3.0 are initial moves toward providing each individual control over how they organize and consume Channels and content. You’ll see this manifested in a redesigned Channels panel that now provides each desktop the ability to “Pin” the Channels they consume most. Additional features that let everyone customize their experience while letting you maintain administrative oversight and control will continue to make AVAIL more powerful and customizable to fulfill differing needs and workflow preferences. Optionality is a good thing. I just returned from Autodesk University where we engaged in numerous conversations about the value of employing content management systems. There’s obvious value in the immediate task-at-hand of organizing volumes of files (content) and making them easier to find and use throughout your organization. A topic that isn’t quite as obvious is the value of a content management system as a System of Engagement (SOE). Being able to capture knowledge throughout your organization in the form of the content that is being generated and more importantly, where, when and how it is being used is of tremendous value. Knowledge can be fleeting. At AVAIL we’re focused on helping you capture and manage that knowledge. To help you engage and capture feedback related to the content you manage with AVAIL we’re introducing a new feature we refer to as Flags & Comments. As a start, Flags are labeled as “needs attention” and provide a mechanism for your users to alert you or your content admins. Tightly coupled with Flags are Comments. You can require that a Flag be accompanied by a Comment. For example, if a user triggers a “Needs Attention” flag they can then be required to include verbose notes on what problem they see with the content. AVAIL then provides the admin an easy way to filter the content containing Flags and take appropriate action. Over time we plan to let you define a Flag’s meaning (“needs attention”, “mark as complete”, etc). We will also soon introduce Notes which allow you to provide information to permanently accompany any content managed with AVAIL. Flags, Comments and Notes are just the first step in providing you with valuable workflow tools to manage content and an important piece of a System of Engagement solution. Ability to suppress “Join AVAIL” invitation when sharing a Channel. Active Directory integrations are in full swing this fall as AVAIL is “rolling across the enterprise”. With AVAIL Active Directory (AD) integration it has never been easier to manage hundreds of users. As new users are added or removed from your normal IT process through AD they’re automatically logged into AVAIL and authenticated. No login or password required! AD users can also suppress the “Join AVAIL” emails when sharing a Channel across your firm. If you have 50 or more users contact sales@getavail.com to discuss AVAIL Enterprise Licensing for your firm. As hundreds of new channels are created in AVAIL each month we’re working hard to fine tune how you can most easily deploy and manage your AVAIL Channels. With this release of AVAIL we’re adding the ability to easily create a Channel that is shared with everyone in your firm without having to select them individually. We’re turning this on for existing accounts this week so look for the new built-in group called “Everyone in My Plan” shortly. We released AVAIL commercially a couple of months ago in late August after the better part of 4 years of development and eight months in beta. It has been an exciting time and it’s gratifying to work with all of you as AVAIL progresses. We’ll use this blog to keep you updated on the latest releases and features as well as glimpses of what’s coming next. We’ve been trying to keep everyone up-to-date via emails which we’ll continue to publish but we thought a more permanent spot for the release notes and other communication was need, thus blog.getavail.com is born! Information is tracked in Google Analytics as “Events” which are made up of Categories, Actions, Labels and Values. Note that by default Google Analytics date range is set one day behind. If you want to see current data you’ll need to adjust the timeframe to include today. If you’re using advanced BA and BI tools such as Tableau or Microsoft Power BI you can import your Google Analytics data for further analysis. AVAIL Release News: Project Mode is now Live!